The deepest well to be drilled at Dukes Wood was No. 146 to a depth of 7,473 feet. 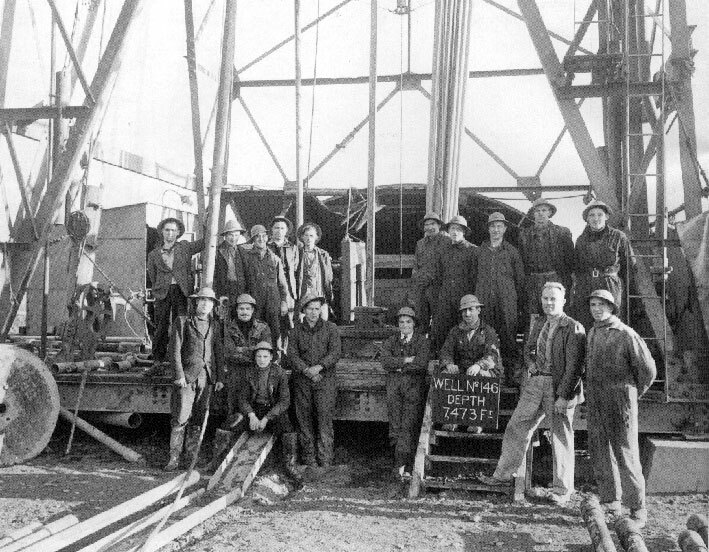 Pictured are members of the drilling team involved in this achievement. Dukes Wood is an example of co-operation between the oil industry and the Nottinghamshire Wildlife Trust. It combines an area of ancient and secondary woodland with what was the site of the UK’s first oil field. Some of the ‘nodding donkey’ pumps have been restored and can be seen on the trail. On the nature trial you’ll find the bronze statue of The Oil Patch Warrior, commemorating the American ‘Roughnecks of Sherwood Forest’. The Museum is situated on the Nature Trail and contains many artifacts and pictures dealing with the story of UK Oil fields both offshore and onshore and the triumphs and the tragedies of the people who discovered and produced Oil and Gas sometimes in times of great national need.